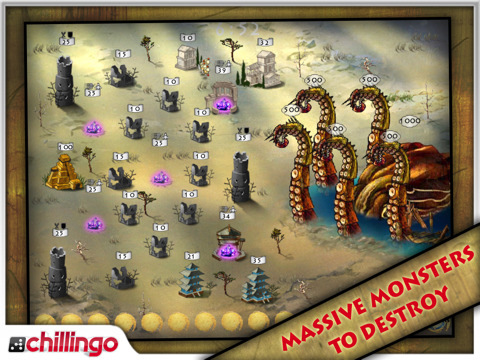 Civilizations Wars HD for iPad is a strategy based war game that lets you contend against other tribes for a magical secret power that has arisen from deep into the past. The story behind the game itself is founded on a short video that you can skip over should you wish to, but the game is all about strategically moving your troops so you can multiply your troops, diminish enemy forces, and gain magical powers. People who have played previous iPad app store favorite Modern Conflict will recognize the overall drag-your-troops attack strategy. The biggest difference between the two games lies in the fact that Modern Conflict is a ground troops army game while Civilizations Wars HD is a cuter game created with the sketches of ancient civilizations in war. Civilizations Wars HD is also a bit slower because the warriors on foot don’t move as fast as tanks or helicopters, but that’s not to say that Civilizations Wars HD will leave you with a second of mindlessness. 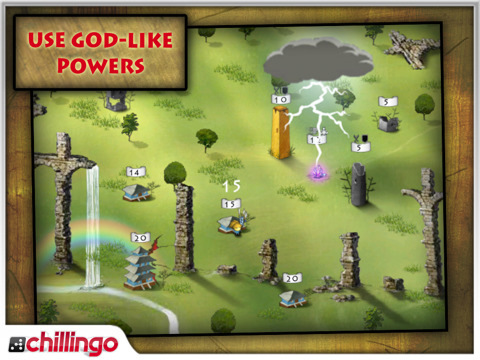 The game is full of opportunities for dropping meteors and lightning storms on enemy fortresses, and much much more. 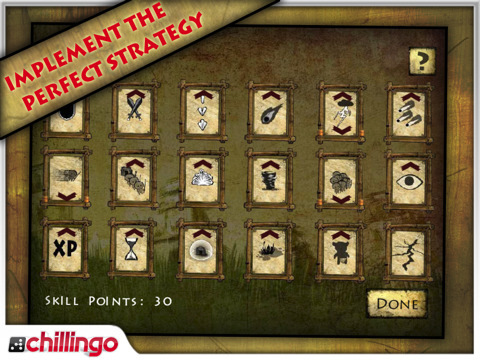 As you advance you gain experience points that let you boost specific skills, and then you can adjust your power points to create a winning strategy for each winning level. 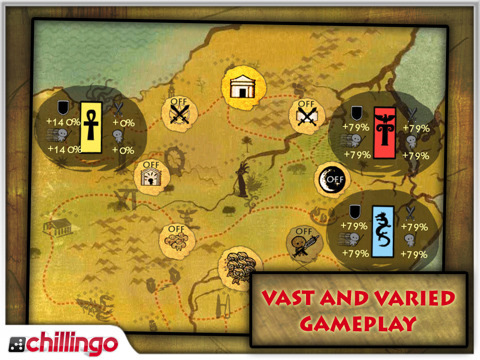 Graphically, Civilizations Wars HD is excellent in its slightly hieroglyphic style, and everything about the game is smooth. Dropping bombs and such can be touchy if you miss a building by just a centimeter, but this is intentional and meant to keep gamers on the ball. When you’re done with a level it’s easy to save out of it, and Civilizations Wars has replay appeal because of the sheer fact that beating levels with specific constraints gives you more experience points and brings you into higher levels more equipped for the enemy. All said and done, this Chillingo title is one of those games that will keep you on your toes for hours on end. There might not be a lot to the worlds in terms of interactivity and discovery, but the strategy is fun and highly addictive. Buy this title when you have some time on your hands because it will be all you can think about for hours on end. 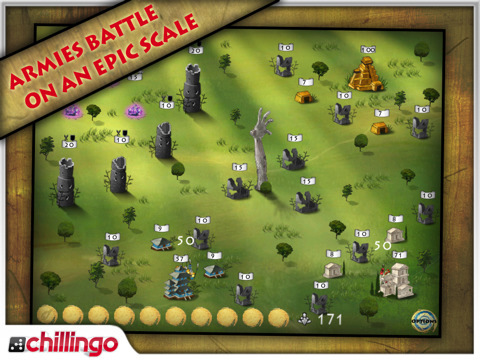 Bottom Line: Civilizations Wars HD is an incredibly addictive strategy game where you must move your troops strategically to overtake the enemy. It may be simple in principle, but it’s endlessly fun.